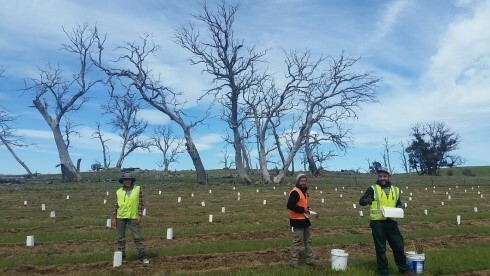 Upper Snowy Landcare (USL) and Greening Australia (GA) under the NSW Government’s Bush Connect grant entitled, Monaro Tree Comeback Project, are getting more than 10 ha prepared this year for planting in response to the tree dieback epidemic affecting thousands of acres across the Monaro. A proportion of the 10 hectares, spread across four properties within the dieback zone, will be planted out as straight biodiversity patches using seedlings from local remnant species in a 50% shrub / 50 % tree ratio. Other plots will be set up as a trial with input from the CSIRO to investigate the benefits of planting more robust and persistent species and subspecies of the affected Eucalyptus viminalis (Ribbon/Manna Gum) and test cool burning to enhance soil quality. The USL were given a boost late last year, having received the ‘Monaro Service Award ’ for service to the environment in revegetating areas across the Monaro devastated by tree dieback. The award was presented by John Barilaro MP Member of Monaro and Bronnie Taylor, MLC in a well-attended ceremony in Cooma. Further support came from the NSW Government, under the Minister for the Environment’s Conservation Fund, who provided $5,000 to help USL develop and print a free brochure for landholders that will provide a step by step guide on best practice techniques for plant survival on the Monaro. Monaro Native Tree Nursery, Michael Platts and helper Sean Brooks planting to re-create some necessary connectivity. 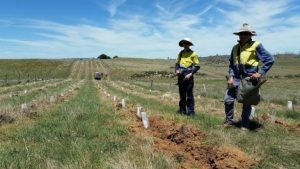 Conservation Volunteers Australia putting on tree guards critical for seedling survival.